I’ve been spending most of my work hours at a different desk lately, one that I’ve owned for a while but only recently began using as my primary workspace. The unique thing about this desk is that it has a roll of paper attached to it that I can pull out and cover the table with, providing me with ample doodling space around my computer, notebooks, and mugs full of pens. The way in which I use that drawable space is constantly evolving, but what has surprised me is how good it feels to be able to mark up my workspace in whatever ways I want. 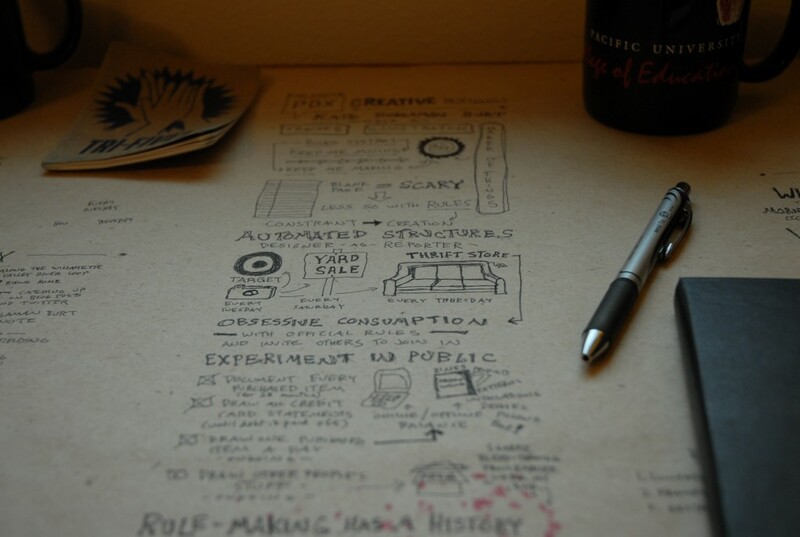 To draw a quick doodle, make plans for a new project, write down quotes I want to illustrate, make to-do lists, outline an upcoming blog post, even draw out a quick sketchnote of something I’m reading or listening to. Those notes, ideas, and reminders then just hang out there as I work and play throughout the day. When I complete the to-dos I cross them out. The project ideas and outlines I build on over time. When something new comes to mind, I find some open space and jot it down. I don’t intentionally fill this space in a left-to-right, top-to-bottom order. I just find a clear spot and start writing or drawing. 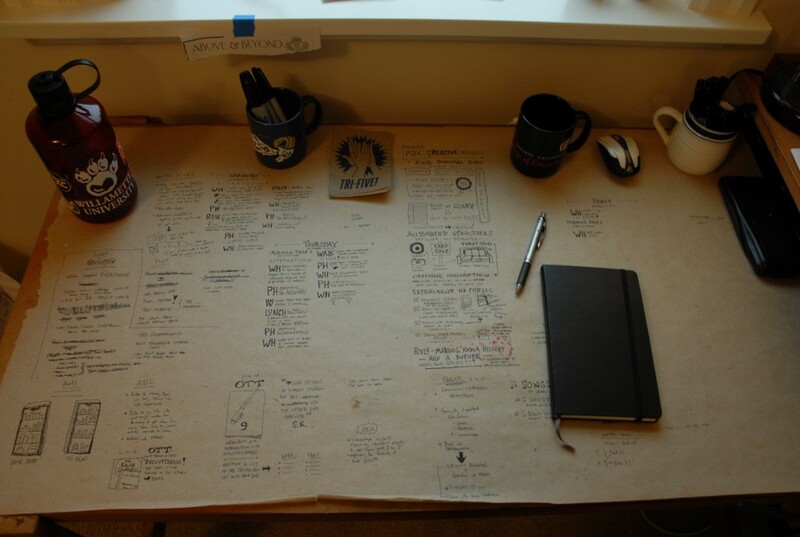 Once I feel that things are getting a bit cluttered, when it becomes hard to find open space for new ideas, I simply clear the desk, roll out some new paper, and start filling it again. I tear off the portion with old notes and look through it to see if there are pieces I haven’t acted on yet – ideas I still want to pursue or to-dos that have yet to be done. What I’m finding is that this desk helps me to get ideas out of my head and onto something tangible quicker than any other process I’ve tried in the past. I don’t have to go searching for the right notebook that will be the best place for that idea. I don’t have to wake up my phone and pull up the right app. I just jot the thing down in that highly visible place in front of me, knowing that I can revisit it whenever I want. I lucked into this table – a friend who was clearing out her basement thought I might be interested in using it. And she was right. I’ve become so attached to it that I think drawable workspaces are going to remain a constant in my relatively new lifestyle with creative work at its core. 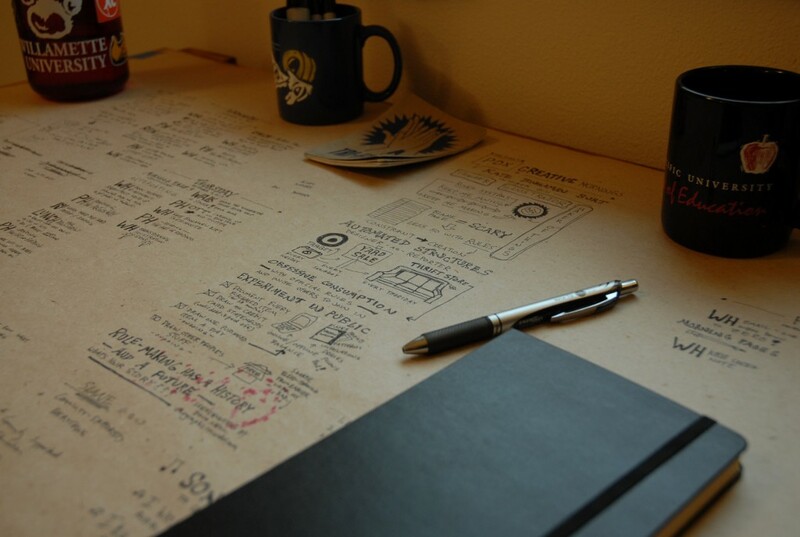 Have you ever experimented with workspaces that you can draw on? In what way do you use them? Let us know your thoughts in the comment section below.